The MQ-1 Predator is an unmanned aerial vehicle (UAV) which the United States Air Force describes as a MALE (medium-altitude, long-endurance) UAV system. It can serve in a reconnaissance role, and it can also carry and use two AGM-114 Hellfire missiles. The aircraft has been in use since 1995, and been in combat over Afghanistan, Bosnia, Serbia, Iraq, and Yemen. It is remote-controlled by humans, not an autonomous aircraft. The MQ-1 Predator is a system, not just an aircraft. The fully operational system consists of four air vehicles (with sensors), a ground control station (GCS), a Predator primary satellite link communication suite and 55 people. 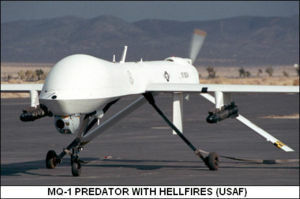 In the over-all U.S. Air Force integrated UAV system, the Predator is considered a "Tier II" vehicle. The Predator system was initially designated the RQ-1 Predator, with the "R" is the Department of Defense designation for reconnaissance, "Q" means unmanned aircraft system. The "1" describes it as being the first of a series of purpose-built unmanned reconnaissance aircraft systems. Pre-production systems were designated as RQ-1A, while the RQ-1B (not to be confused with the RQ-1 Predator B, which became the MQ-9 Reaper) denotes the baseline production configuration. It should be emphasized that these are designations of the system as a unit. The actual aircraft themselves were designated RQ-1K for pre-production models, and RQ-1L for production models. In 2002, the Air Force officially changed the designation to MQ-1 (the "M" designates multi-role) to reflect its growing use as an armed aircraft. A Predator flies on a simulated Navy aerial reconnaissance flight off the coast of southern California on Dec. 5, 1995. The CIA and the Pentagon had each been experimenting with reconnaissance drones since the early 1980s. The CIA preferred small, lightweight, unobtrusive drones, in contrast to the USAF. In the early 1990s the agency became interested in the "Amber", a drone developed by Abraham Karem. Karem was the former chief designer for the Israeli Air Force, and had migrated to the United States in the late 1970s. Karem's company had since gone bankrupt and been bought up by a US defense contractor. The CIA secretly bought five drones (now called the "Gnat") from them. Karem agreed to produce a quiet engine, which until then sounded like "a lawnmower in the sky". The new development became known as the "Predator". General Atomics Aeronautical Systems was awarded a contract to develop the Predator in January 1994, and the initial Advanced Concept Technology Demonstration (ACTD) phase lasted from January 1994 to June 1996. The aircraft itself was a derivative of the GA Gnat 750 UAV. During the ACTD phase, three systems were purchased from GA, comprising twelve aircraft and three ground control stations. From April through May, 1995, the Predator ACTD aircraft were flown as a part of the Roving Sands 1995 exercises in the U.S. The exercise operations were successful, and this led to the decision to deploy the system to the Balkans later in the summer of 1995. Cost for an early production Predator was about $3.2 million USD. The CIA arranged for Air Force teams trained by the 11th Reconnaissance Squadron at Nellis Air Force Base, Nevada, to fly the agency's Predators. "First in Bosnia and then in Kosovo, CIA officers began to see the first practical returns ..."
By the time of the Afghan campaign, the Air Force had acquired 60 Predators, and lost 20 of them in action. Few if any of the losses were from enemy action, the worst problem apparently being foul weather, particularly icy conditions. Some critics within the Pentagon saw the high loss rate as a sign of poor operational procedures. In response to the losses caused by cold weather flight conditions, a few of the later Predators obtained by the USAF were fitted with deicing systems, along with an uprated turbocharged engine and improved avionics. This improved "Block 1" version was referred to as the "RQ-1B", or the "MQ-1B" if it carried munitions; the corresponding air vehicle designation was "RQ-1L" or "MQ-1L". improvements in communications systems [perhaps by use of the USAF's JSTARS system] now made it possible, at least in theory, to fly the drone remotely from great distances. It was no longer necessary to use close-up radio signals during the Predator's takeoff and ascent. The entire flight could be controlled by satellite from any command center with the right equipment. The CIA proposed to attempt over Afghanistan the first fully remote Predator flight operations, piloted from [the agency's headquarters at] Langley. The Predator air vehicle and sensors are controlled from the ground station via a C-band line-of-sight data link or a Ku-band satellite data link for beyond-line-of-sight operations. During flight operations the crew in the ground control station is a pilot and two sensor operators. The aircraft is equipped with Multi-spectral Targeting System, a color nose camera (generally used by the pilot for flight control), a variable aperture day-TV camera, and a variable aperture infrared camera (for low light/night). Previously, Predators were equipped with a synthetic aperture radar for looking through smoke, clouds or haze, but lack of use validated its removal to reduce weight. The cameras produce full motion video and the synthetic aperture radar produced still frame radar images. There is sufficient bandwidth on the datalink for two video sources to be used at one time, but only one video source from the sensor ball can be used at any time due to design limitations. Either the daylight variable aperture or the infrared electro-optical sensor may be operated simultaneously with the synthetic aperture radar, if equipped. All Predators are equipped with a laser designator that allows the pilot to identify targets for other aircraft and even provide the laser-guidance for manned aircraft. This laser is also the designator for the AGM-114 Hellfire that are carried on the MQ-1. Each Predator air vehicle can be disassembled into six main components and loaded into a container nicknamed "the coffin." This enables all system components and support equipment to be rapidly deployed worldwide. The largest component is the ground control station and it is designed to roll into a C-130 Hercules. The Predator primary satellite link consists of a 6.1 meter (20 ft) satellite dish and associated support equipment. The satellite link provides communications between the ground station and the aircraft when it is beyond line-of-sight and is a link to networks that disseminate secondary intelligence. The RQ-1A system needs 1,500 by 40 meters (5,000 by 125 ft) of hard surface runway with clear line-of-sight to each end from the ground control station to the air vehicles. Initially, all components needed be located on the same airfield. Currently, the US Air Force uses a concept called "Remote-Split Operations" where the satellite datalink is located in a different location and is connected to the GCS through fiber optic cabling. This allows Predators to be launched and recovered by a small "Launch and Recovery Element" and then handed off to a "Mission Control Element" for the rest of the flight. This allows a smaller number of troops to be deployed to a forward location, and consolidates control of the different flights in one location. The improvements in the MQ-1B production version include an ARC-210 radio, an APX-100 IFF/SIF with mode 4, a glycol-weeping “wet wings” ice mitigation system, up-graded turbo-charged engine, fuel injection, longer wings, dual alternators as well as other improvements. On 18 May 2006, the Federal Aviation Administration (FAA) issued a certificate of authorization which will allow the M/RQ-1 and M/RQ-9 aircraft to be used within U.S. civilian airspace to search for survivors of disasters. Requests had been made in 2005 for the aircraft to be used in search and rescue operations following Hurricane Katrina, but because there was no FAA authorization in place at the time, the assets were not used. The Predator's infrared camera with digitally-enhanced zoom has the capability of identifying the heat signature of a human body from an altitude of 3 km (10,000 feet), making the aircraft an ideal search and rescue tool. The longest known Predator flight was 40 hours, 5 minutes. The Air Force handed the Predator over to the service's Big Safari office after the Kosovo campaign in order to accelerate tests of the UAV in a strike role, fitted with reinforced wings and stores pylons to carry munitions, as well as a laser target designator. This effort led to a series of tests, on February 21, 2001, in which the Predator fired three Hellfire anti-armor missiles, scoring hits on a stationary tank with all three missiles. The scheme was put into service, with the armed Predators given the new designation of MQ-1A. Given that a Predator is very unobtrusive and the Hellfire is supersonic, such a combination gives little warning of attack. In the winter of 2000-2001, after seeing the results of Predator reconnaissance in Afghanistan (see below), Cofer Black, head of the CIA's Counterterrorist Center (CTC), became a "vocal advocate" of arming the Predator with missiles to target Osama bin Laden in the country. He also believed that CIA pressure and practical interest was causing the USAF's armed Predator program to be significantly accelerated. Black, and "Richard", who was in charge of the CTC's Bin Laden Issue Station, continued to press during 2001 for a Predator armed with Hellfire missiles. Further weapons tests occurred between May 22 and June 7, 2001, with mixed results. While missile accuracy was excellent, there were some problems with missile fusing ..." In the first week of June, in the Nevada Desert, a Hellfire missile was successfully launched on a replica of bin Laden's Afghanistan Tarnak residence. A missile launched from a Predator exploded inside one of the replica's rooms; it was concluded that any people in the room would have been killed. However, the armed Predator did not go into action before 9/11. The Air Force has also investigated using the Predator to drop battlefield ground sensors, and to carry and deploy the "Finder" mini-UAV. During the initial ACTD phase, the United States Army led the evaluation program, but in April 1996, the Secretary of Defense selected the U.S. Air Force as the operating service for the RQ-1A Predator system. The 11th, 15th, and 17th Reconnaissance Squadrons, Creech Air Force Base, Nevada, and the Air National Guard's 163d Reconnaissance Wing at March Air Reserve Base, California, currently operate the MQ-1 (see below). In 2005, the U.S. Department of Defense recommended retiring Ellington Field's 147th Fighter Wing's F-16 Falcon fighter jets (a total of 15 aircraft), which was approved by the Base Realignment and Closure committee. They will be replaced with 12 MQ-1 Predator UAVs. The wing's combat support arm will remain intact. The 272nd Engineering Installation Squadron, an Air National Guard unit currently located off-base, will move into Ellington Field in its place. In January 2006, the California Air National Guard's 163rd Air Refueling Wing began the process of transitioning from operating the KC-135 tanker to the MQ-1 from their March ARB in California. That transition was completed in late 2006. The unit was redesignated the 163rd Reconnaissance Wing on 28 November 2006. A report in March 2007 indicated that U.S. Air Force had lost 53 of the 139 Predators that were delivered. U.S. Customs and Border Protection is operating an unknown number of Predators. The first overseas deployment was to the Balkans, from July to November 1995, under the name Nomad Vigil. Operations were based in Gjader, Albania. Several Predators were lost during Nomad Vigil. One aircraft (serial 95-3017) was lost on April 18, 1999, following fuel system problems and icing. A second aircraft (serial 95-3019) was lost on May 13, when it was shot down by a Serbian Strela-1M surface-to-air missile over the village of Biba. A Serbian TV crew videotaped this incident. A third aircraft (serial number 95-3021) crashed on May 20 near the town of Talinovci, and Serbian news reported that this, too, was the result of anti-aircraft fire. In 2000 a joint CIA-Pentagon effort was agreed to locate Osama bin Laden in Afghanistan. Dubbed "Afghan Eyes", it involved a projected 60-day trial run of Predators over the country. The first experimental flight was held on September 7, 2000. White House security chief Richard A. Clarke was impressed by the resulting video footage; he hoped that the drones might eventually be used to target Bin Laden with cruise missiles or armed aircraft. Clarke's enthusiasm was matched by that of Cofer Black, head of the CIA's Counterterrorist Center (CTC), and Charles Allen, in charge of the CIA's intelligence-collection operations. The three men backed an immediate trial run of reconnaissance flights. Ten out of the ensuing 15 Predator missions over Afghanistan were rated successful. On at least two flights, a Predator spotted a tall man in white robes at bin Laden's Tarnak Farm compound outside Kandahar; the figure was subsequently deemed to be "probably bin Laden". "A large video screen loomed in the middle of the CIA's makeshift flight operations center. Air Force drone pilots and CIA officers from the Counterterrorist Center and the CTC's bin Laden unit huddled in the darkened room in the wooded Langley campus from midnight to dawn". But by mid-October, deteriorating weather conditions made it difficult for the Predator to fly from its base in Uzbekistan, and the run of flights was suspended. It was hoped to resume flights in spring 2001, but debates about the use of an armed Predator (see above) delayed a restart. Only on September 4, 2001 (after the Bush cabinet approved a Qaeda/Taliban plan) did CIA chief Tenet order the agency to resume reconnaissance flights. The Predators were now weapons-capable, but didn't carry missiles because the host country (presumably Uzbekistan) hadn't granted permission. Subsequent to 9/11, approval was quickly granted to ship the missiles, and the Predator aircraft and missiles reached their overseas location on September 16, 2001. The first mission was flown over Kabul and Kandahar on September 18 without carrying weapons. Subsequent host nation approval was granted on October 7 and the first armed mission was flown on the same day. On February 4, 2002, an armed Predator attacked a convoy of sport utility vehicles, killing a suspected al Qaeda leader. The intelligence community initially expressed doubt that he was Osama bin Laden. On May 13, 2005, Haitham al-Yemeni, an al Qaeda explosives expert from Yemen, was killed in a village in northwest Pakistan near the Afghanistan border by a CIA-operated MQ-1 Predator aircraft firing a Hellfire missile. On December 3, 2005, a US Predator UAV reportedly killed Al Qaeda #3 Chief Abu Hamza Rabia in his sleep in Haisori, Pakistan. Four others were also killed. On January 13, 2006, several US Predators conducted an airstrike on Damadola village in Pakistan where al Qaeda's second-in-command Ayman al-Zawahiri was reportedly located. CIA Predators reportedly fired 10 missiles killing 18 civilians, including five women and five children. According to Pakistani authorities, the U.S. strike was based on faulty intelligence and al-Zawahiri was not present in the village. Pakistani officials nevertheless claimed that Midhat Mursi (Abu Khabab al-Masri) al Qaeda's master bomb maker and chemical weapons expert, Khalid Habib the al Qaeda operations chief for Pakistan and Afghanistan, and Abdul Rehman al Magrabi a senior operations commander for al Qaeda were all killed in the Damadola attack. U.S. and Pakistani officials now say that none of those al Qaeda leaders perished in the strike and that only local villagers were killed. On October 30, 2006, the Bajaur airstrike was conducted, targeting an alleged militant training camp and targeting al Qaeda's second-in-command, Ayman al-Zawahiri. The strike hit a religious school where militants were believed to be present. Eyewitness reports said that two explosions were heard following a missile being fired from an MQ-1 Predator. Pakistani intelligence officials have told western media that Predators were used in the strike, which utilized Hellfire missiles. Although Zawahiri does not appear to have been caught in the strike, Pakistani officials have stated that between two and five senior al Qaeda fighters, including the mastermind of the airliners plot in the UK, were killed in the raid. While some reports state that the school was a religious training center, Pakistani authorities, including President Musharraf, have stated that the school provided military training to al Qaeda militants. Casualty figures range from 80 to 85 people killed. On January 29, 2008 an MQ-1B killed Abu Laith al-Libi in Mir Ali. Images published recently by the Pakistan Army shows that the USA delivered some MQ-1 Predators to Pakistan. On November 3, 2002, a CIA Predator (being flown by an Air Force pilot from a French military base, Camp Lemonier, in Djibouti) was again in a military strike. A Hellfire missile was fired at a car in Yemen, killing Qaed Senyan al-Harthi, an al-Qaeda leader thought to be responsible for the USS Cole bombing. It was the first direct US strike in the War on Terrorism outside Afghanistan. During the initial phases of the 2003 U.S. invasion of Iraq, a number of older Predators were stripped down and used as decoys to entice Iraqi air defenses to expose themselves by firing. From July 2005 to June 2006, the 15th Reconnaissance Squadron participated in more than 242 separate raids, engaged 132 troops in contact-force protection actions, fired 59 Hellfire missiles; surveyed 18,490 targets, escorted four convoys, and flew 2,073 sorties for more than 33,833 flying hours. Steve Coll, Ghost Wars (Penguin, 2005 edn), pp.527-8 and 658 note 5. Steve Coll, Ghost Wars (Penguin, 2005 edn), pp.529 and 658 note 6. Steve Coll, Ghost Wars (Penguin, 2005 edn), pp.529-32. Steve Coll, Ghost Wars (Penguin, 2005 edn), pp.534, 548-9; The CIA and the Predator Drone (2000-1); Statement of CIA chief Tenet to 9/11 Commission, March 24, 2004, p.15; Barton Gellman, "A Strategy's Cautious Evolution", Washington Post,Jan. 20, 2002, p.A01. 9/11 Commission Report, chapter 6, pp.213-14; Tenet Testimony to the 9/11 Commission, March 24, 2004, p.16. Telegraph.co.uk article, "Pakistan fury as CIA airstrike on village kills 18"
Whitlock, Craig (2007-09-11). The New Al-Qaeda Central: Far From Declining, the Network Has Rebuilt, With Fresh Faces and a Vigorous Media Arm. Washington Post. Anwarullah Khan . 82 die as missiles rain on Bajaur: Pakistan owns up to strike; locals blame US drones. Dawn, Pakistan's most widely circulated English language newspaper.